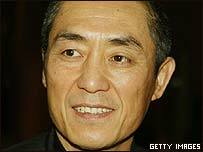 Hollywood films are increasingly showing the influences of Chinese cinema, says director Zhang Yimou. Thanks to his two international hits, Hero and House Of Flying Daggers, Zhang is one of China's most high-profile directors. The particular style of martial art in these pictures, termed wushu, has cropped up in a number of US movies - most notably in Quentin Tarantino's Kill Bill films, he says. "Because of the influence of Chinese martial arts films, Hollywood movies are changing," Zhang told the BBC's The Culture Show. "The actions in the films are more beautiful, more rhythmic, and use some enhanced special effects. I think it's a great thing." 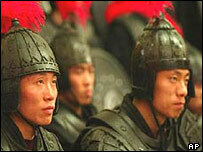 Martial arts epic Hero tells the story of Emperor Qin Shihuang's campaign to unify China more than 2,000 years ago. The film went to the top of the US box office chart and has so far taken more than $50m (£26m) - a relatively large amount for a foreign film in the US. House Of Flying Daggers has done less well, managing around $10m (£5m). Zhang says he had already noticed aspects of Asian films in Western cinema, particularly since the success of Crouching Tiger Hidden Dragon in 2000. "To Western audiences, Crouching Tiger Hidden Dragon, for example, is seen as something very refreshing - to see man-powered flight. "But now there are more and more of these kinds of films, American movies have also begun to adopt these kinds of scenes with people flying. "So after watching lots of these films, people will get used to seeing this exaggerated artistic style, and it won't be so strange any more." Zhang says he believes appreciation for a film can be "universal", pointing out that people who had "no idea" about Emperor Qin had enjoyed Hero. "What attracts them, I believe, is the movie's form, the use of colour, its music," he says. "They are attracted by the mood of the movie." Zhang says film-goers can also gain "cultural and historical information" from his work. "Western audiences can gain an impression of China from my films. This is an excellent channel for promoting China's culture," he says. But he adds: "Many things, feelings especially, are common to all human beings. "As long as the film appeals to universal human feelings, all audiences will enjoy it." Before Hero and House Of Flying Daggers, Zhang did not have the budget to make large-scale, epic pictures. His previous films included the low-budget, though critically-acclaimed, Red Sorghum and Raise the Red Lantern. However, he says Hero's success does not mean he will now become solely interested in major productions. "When I look back at the times I shot artistic movies, I found I learnt quite a lot from them.